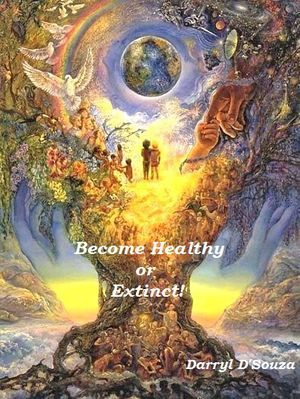 Become Healthy or Extinct! may seem like an ominous title for a book to some. Sceptics would dismiss it as unwarranted spread of fear. Could there be a measure of truth in the book, to support such a claim? Is the human race without question on its way to extinction? Only one, who has braved the rough waters of ill health and lived to tell the tale of his victory, could provide the most justifiable response to these queries. Darryl D’Souza began his professional career as an industrial engineer after passing out from Vishwakarma Institute of Technology, Pune. Today, he goes as therapist and alchemist, in the service of mankind. His harrowing battle with illness began at age 20, jumpstarted with a bout of pneumonia. Following which he suffered an attack of amoebiasis as a result of consuming mountain water. The disease persisted despite various doctors attempting to treat him. At this time, he admits, his eating habits were those of a typical student living away from home. Street food and spicy treats mostly made the menu. A diagnosis of amoebic colitis spurred an urgent quest for treatment and though it was brought under control after some years, the candidiasis that accompanied the illness was debilitating. It took a lot out of him even costing him his job. The excruciating discomfort of the skin disease brought him to the brink of suicide. Darryl tried everything from mainstream to alternative medicine like homeopathy and Ayurveda , giving it enough time to work. He resorted to prayers and energy healing as well, but to no avail. The outcome was unfailingly disappointing. About this time his digestive system was badly damaged and he was suffering from third degree piles, an affliction of the elderly. He tried out acupressure with Ashvin Dalal, an engineer, as a final resort. Though sceptical of the process initially, he soon learned of its miraculous attributes. As he dutifully followed the course of treatment, his diseases went into remission after the first two weeks. In six months’ time the allergies that were plaguing him had vanished without the use of any kind of medication. Darryl was so taken up with the turnabout that he started practising acupressure for himself. However, it could not cure every disease nor was it a sure-fire answer to chronic problems. If treatment was halted the disease would return. The limitations of acupressure prodded him to develop what he calls ‘natural health therapy’, which encompasses acupressure and a healthy diet. There is recourse to food items in their most unaltered state. He uses the better aspects of modern medicine too. It is in essence the integration of the best of every medical discipline. 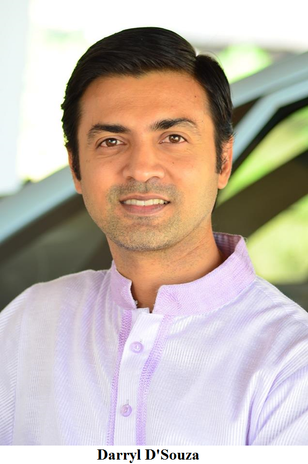 He began conducting wellness workshops and wrote a book based on his experiences. That book is Become Healthy or Extinct! The book is not just a compilation of his own understandings but includes the work he has done with doctors too.Darryl claims there is a trend that sees younger and younger individuals falling prey to ailments once solely witnessed amongst the elderly. The pace has picked up in the last ten years and in twenty years even three year old children and babies will have to contend with chronic afflictions. The title of the book comes from this theory. According to Darryl, the current state of affairs in the medical field is that medicines are used more as props rather than cures. The plethora of drugs manufactured by various companies may allow you to survive but thriving is a different matter altogether. In the face of the deluge of illnesses that people are being threatened by and more diseases emerging on the horizon, medical science seems ill prepared to meet the challenge.One reason for this, he says, ‘…is that medicines are made of wrong substances…inorganic substances; whereas the human body is hundred per cent organic.’ Even if they start off as organic substances the manner in which they are treated that is heated to high temperatures, distilled and so on, change the molecular structure of the substance to render it inorganic. ‘Modern medicine does not understand the human body completely,’ he says. ‘A macrocosmic view is needed.’ He talks about the body having seven layers of energy (chakras) and the imbalance in these layers, and mental problems causing physical illnesses and vice versa. 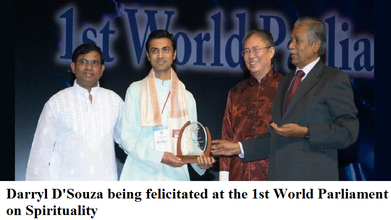 Darryl is now the secretary of The World United - Doctors' & Healers' Association (www.theworldunited.org). Although he has the support of many allopathic doctors there are still those who take offence to his estimation of allopathy. They uphold the extensive research that goes into medical science. ‘Of course a diet would make a difference and so would being rid of stress,’ says a respiratory physician, dismissing Darryl’s claims. Nonetheless, Darryl has one defence against this attack in that he has practiced this system on himself and looks remarkably young for a 44 year old man. He terms this ‘reverse aging’. He has had no serious illnesses since May 2006. Darryl also believes that the probability of heredity caused diseases can be reduced by repairing faulty DNA during the formative years of 5 to 22 years of age with the use of his techniques. He does admit that most illnesses are curable but not all. One has to remember, however, that various factors come into play in the pursuit of good health, such as willingness to change your lifestyle, the ability to persist with a certain prescribed regimen and your genetic make-up. There are no guarantees in every case but some amount of positive change is bound to take place. All one needs is the determination and faith to achieve good health.